Cook Islands Gold Coins are famous for their purity and their unique and unusual designs. The 15 isles known as the Cook Islands cover a total area of just 92 square miles yet they are spread over a massive 1.3 million square miles of the South Pacific Ocean. It's an unusual and far-off land that is the perfect fit for some of the exceptional gold coins that bear its name. 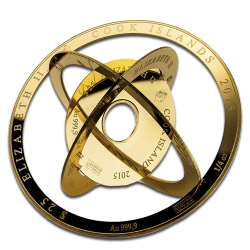 Limited mintages and original design features make special, one-of-a-kind gold coins from the Cook Islands like the .9999 pure Valcambi Cook Islands Armillary an attractive option for new and established investors and collectors. Order your VAT Free Cook Island gold coins for fast, fully insured delivery with coininvest.com.